Change Agent Launches: In Print & Digital! If you’re a member of The Communications Network, you might’ve already received your copy of this year’s Change Agent, the Network’s annual journal. This edition, the Racism Issue, aims to spark conversations about racism and challenge entrenched narratives and practices. Guest edited by Race Card Project founder Michele Norris, the issue features insightful articles from Trabian Shorters of BME Community, Susan Goldberg of National Geographic Magazine, and more. Although we’ve worked with our friends at ComNet to design Change Agent in previous years, we were especially proud to design an issue that covered such an important and relevant topic this year. An article by our Design Director Senongo Akpem was featured in this edition, too—you can read it here. Both versions feature design elements that work across mediums—ensuring that the modern yet personal brand system we developed for the print magazine would be equally successful in a digital format. Working on the Race Issue also brought with it the exciting challenge of questioning our own assumptions during the design process. Senior Designer Kevin Ng notes that he made especially mindful decisions about image choice and the use of white space in order to ensure subtle choices were sending the right messages. 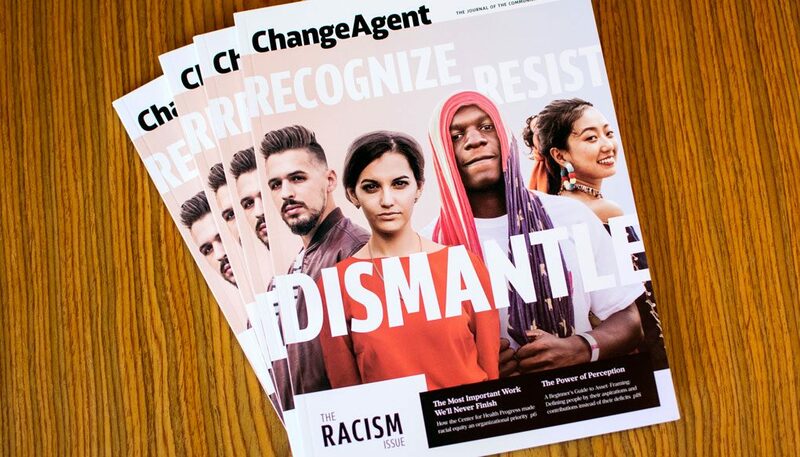 You can check out the new digital edition of Change Agent here, and if you’ve already received your copy in the mail, be sure to mention us (@heyconstructive) and ComNet (@TheComNetwork) on Twitter and Instagram with the tag #ChangeAgent!